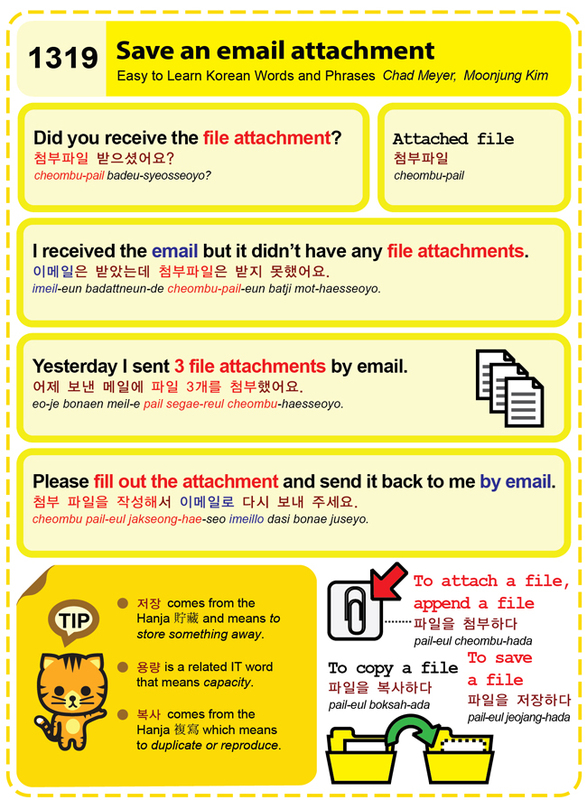 Easy to Learn Korean 1319 – Save an email attachment. This entry was posted in Series and tagged append a file, attached file, capacity, Did you receive the file attachment?, I received the email but it didn’t have any file attachments., Please fill out the attachment and send it back to me by email., save an email attachment, To attach a file, to copy a file, to duplicate or reproduce, To save a file, to store something away, Yesterday I sent 3 file attachments by email., 複寫, 貯藏, 복사, 어제 보낸 메일에 파일 3개를 첨부했어요., 용량, 이메일은 받았는데 첨부파일은 받지 못했어요., 저장, 첨부 파일을 작성해서 이메일로 다시 보내 주세요., 첨부파일, 첨부파일 받으셨어요?, 파일을 복사하다, 파일을 저장하다, 파일을 첨부하다 by easykorean. Bookmark the permalink.